Invented between the great Georgian and Victorian manias of canals and railways to promote and maintain essential turnpike communication across estuaries; fixed to land but never leaving the water; five floating bridges at Dartmouth, Saltash, Torpoint, Southampton and Portsmouth were born of necessity where land bridges, for reasons of navigation or lack of finance, failed to materialise. Devonian James Meadows Rendel was their reluctant inventor. Six times he tried and failed to build a major suspension bridge, so created instead the floating bridge as a cheap, temporary, substitute. 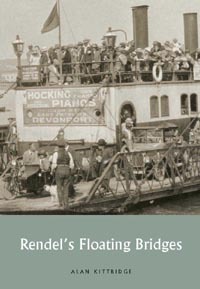 Fourteen further floating bridges were established in the United Kingdom after Rendel抯 death. Eight survive today, including Rendel抯 Torpoint floating bridge; the largest operation of its type in the world. Happily Rendel was an inveterate social networker and climber so this history is a veritable who箂 who of famous engineers and local nobility. But we also meet unsung heroes: local engineers and shipbuilders working in the brand new steam, iron and chain technologies, attempting to realise the demands of a new breed; Civil Engineers.